starting point for astrophysics: The distance of any object in the Universe is a decisive parameter for understanding its energy generation mechanisms. An uncertainty of a factor of 2 in the distance means an uncertainty in the power output in error by a factor of 4.
starting point for cosmology: Distances are necessary in order to determine the structure, evolution and age of the expanding Universe. What is the "distance ladder"? This is the procedure to measure progressively larger comic distances. Objects with well-known properties are used to calibrate larger, brighter and more distant objects, which can in turn be used to calibrate other distance indicators that may work for objects that are seen to greater distances. After several such steps we get means to measure cosmological distances. 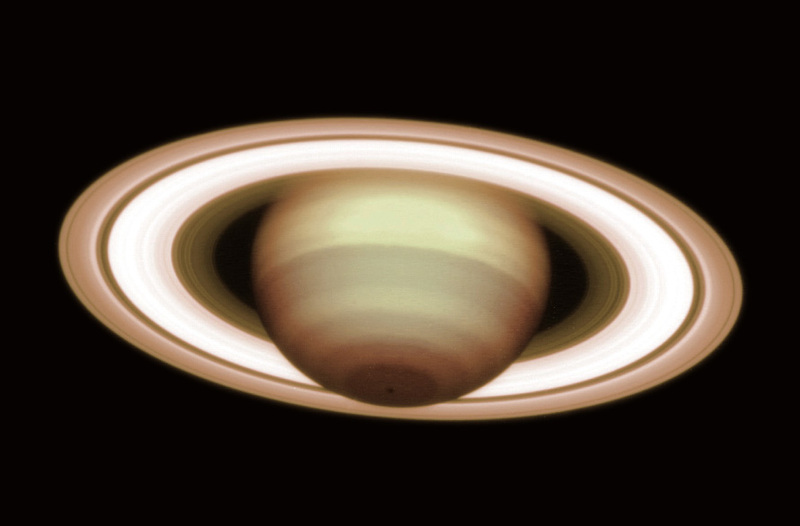 Giant planet Saturn at a distance of 1209 million km (8.08 AU). The photo is a composite of exposures in two near-infrared wavebands (H and K) and displays the intricate, banded structure of the planetary atmosphere and the rings. (ESO VLT NAOS-CONICA Adaptive Optics instrument on December 8, 2001). Today: radar and laser measurements provide distances to major and minor planets with an accuracy of a few meters. How far away are the planets? 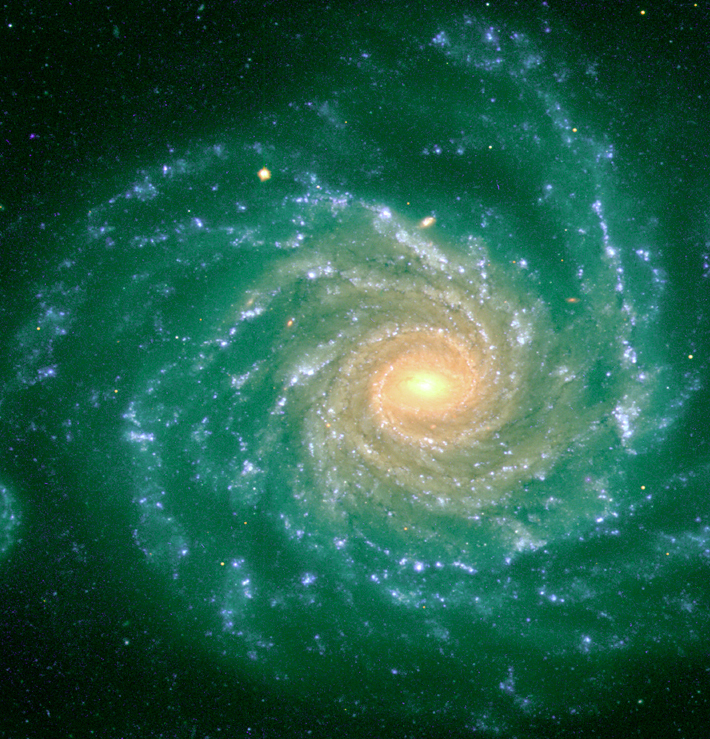 The impressive spiral galaxy NGC 1232, which ressembles the Milky Way galaxy in which we live. The distance is about 100 million light-years. The photo is a composite of three exposures in difference wavebands (colours). (ESO VLT FORS2 multi-mode instrument; 1998). How do we measure the distances in the Milky Way? The Milky Way galaxy in which we live is a very large system. If we could see it from the outside, it would ressemble the spiral galaxy NGC 1232 shown in the photo above. In order to measure the distances to the nearest stars, astronomers use the method of triangulation. 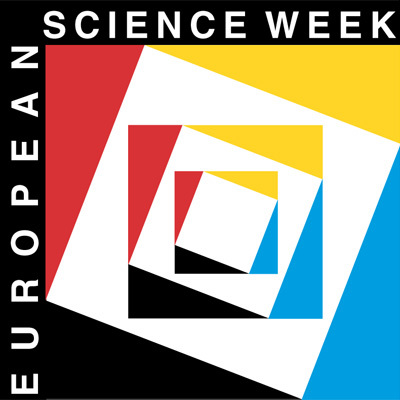 As a result of the motion of the Earth in its orbit around the Sun during the year, the observed position of a nearby star describes a small eclipse on the celestial sphere. The semi-major axis (the angle on the sky) of this ellipse is called the annual parallax (π) . The further the star is away, the smaller is the size of the ellipse and therefore the parallax. By measuring the exact value of its parallax, we may therefore find the distance to a star. Thanks to observations with many telescopes on the ground, as well with the the Hubble Space Telescope and, above all, with the ESA Hipparcos astrometric satellite, we have now measured the parallaxes of stars up to a distance of about 1000 light-years. The parsec (pc) is another distance unit used for stars and galaxies which derives directly from the above mentioned parallax. One parsec is the distance, from which the semi-major axis of the Earth's orbit is seen under an angle of 1 arcsec . There are 3600 arcseconds to 1 degree and 360 degrees to a full circle, so 1 arcsec is a very small angle indeed. If we have measured the parallax π, then the distance d = 1/π [expressed in pc]. 1 pc = 3.26 ly. The nearest star, Proxima Centauri , has the parallax 0.77233 arcsec, corresponding to a distance of 1.2931 pc, or 4.22 ly. Another method is based on the apparent brightness (as we see it in the sky) and the luminosity (the intrinsic brightness, i.e., as it really is) of a star. The astronomers determine the type of a star (its "spectral type") from the observed spectrum and from this they derive its luminosity. Since the apparent brightness of a star decreases with the second power of the distance, a comparison of the luminosity and observed apparent brightness allows to calculate the distance. Yet another method to determine distances is based on a particular type of stars - the "Cepheids" - unstable supergiant stars of spectral type F-G which pulsate with periods of 2-40 days. In 1912, an American astronomer, Miss Henrietta Leavitt, by studying many hundreds of such cepheids in the Magellanic Clouds, found that there exists a relation between the period and the apparent brightness. Because all these stars were located in the same small galaxy and therefore were at approximately the same distance, she discovered the existence of the so-called period-luminosity relation for cepheids . The slower the pulsation, the higher the luminosity. This basic astronomical relation was later refined by other astronomers, including Walther Baade (1950). Therefore, by determining the period of a cepheid star and using Leavitt's period-luminosity relation, we can obtain that star's luminosity. Again, a comparison of the observed apparent brightness and this luminosity then gives the distance. The currently most reliable calibration of the period-luminosity relation is obtained by using some galactic cepheids with known trigonometric parallaxes and those in Magellanic Clouds. How far away are the stars in our Galaxy? A distant cluster of galaxies, known as "Cl2244-02". The long arc is a "gravitational arc", i.e. 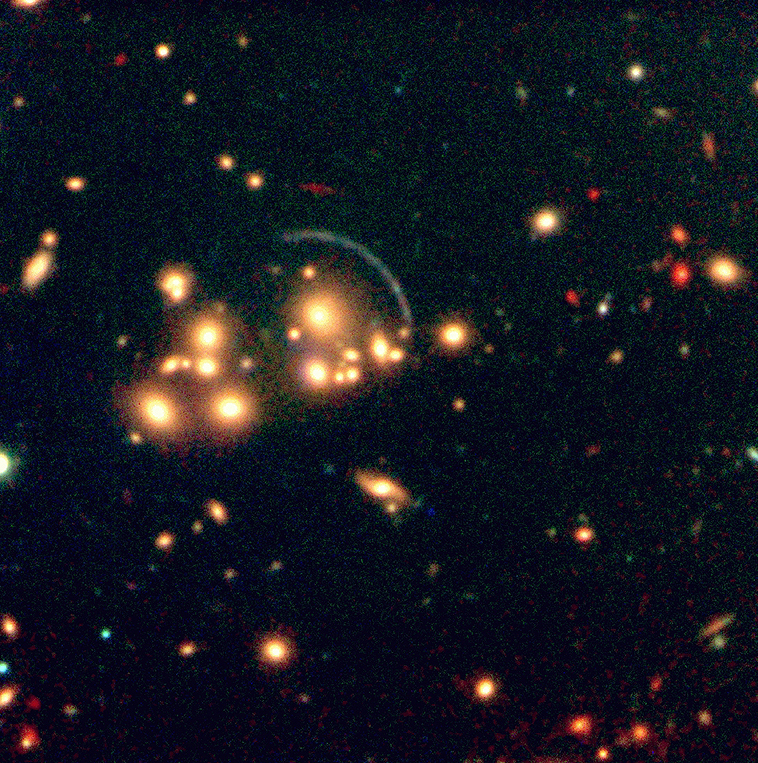 the distorted image of a galaxy seen in that direction, but located far behind this cluster. The distortion is caused by the clusters' gravitational field. One method for distance determination is based on this particular effect. The photo is a composite of three exposures in different visual and infrared wavebands (colours). (ESO VLT Test Camera + ISAAC multi-mode instrument; 1998). How do we measure the distances to galaxies? Astronomers now have several methods of varying reliability to measure distances beyond the Milky Way. The "Cepheid"-method , when used with large ground based telescopes and the Hubble Space Telescope makes it possible to measure reasonably reliable distances up to about 100 million light-years (Mly). The light curves of erupting stars ( "novae" ) in other galaxies resemble those of the novae in the Milky Way galaxy. There is a relation between their luminosity and rate with which their light fade after the outburst. By observing carefully this brightness decrease after a novae outburst, it is therefore possible to estimate its luminosity. Comparison of the luminosity and measured apparent brightness gives the distance. Supernovae (stellar explosion during which a massive star is completely destroyed and its material is blown into surrounding space; a dense object - a neutron star or a black hole may possibly remain behind) are very important distance indicators, thanks to their enormous luminosity. They can therefore be seen over immense distances. It appears that the peak luminosity of the so-called type Ia supernovae is about the same for all explosions. Assuming that this is really so, the observed apparent brightness of such a supernovae allows to calculate its distance. This method works up to about 1000 million light-years. 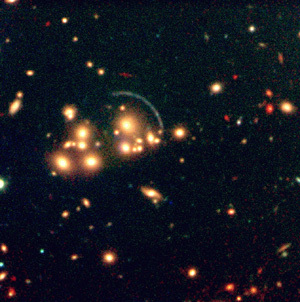 The most used method for galaxies at even large distances is the so-called Hubble-relation . It consists of measuring the redshift (z) by determining how much the spectral lines in the galaxy's light have been shifted from their normal ("laboratory") wavelengths towards longer wavelengths. In 1929, the American astronomer Edwin Hubble found that the spectra of galaxies show a redshift proportional to their distance. We now know that this effect is caused by the expansion of the Universe. A galaxy at a distance of 1 million ly has a velocity of about 20 km/s (the value of the "Hubble constant"), while the Virgo cluster of galaxies at a distance of about 60 million ly is receding with a velocity that is 60 times faster, about 1200 km/s. These are just the most important methods. There are other methods based on the characteristic size or brightness of clouds of ionized hydrogen ("H II regions") or entire galaxies, spiral arms of galaxies or their motions. Even more advanced methods make use of the brightest galaxies in clusters or gravitational lenses. How far away are the galaxies? Each of the mentioned methods to determine distances in the Universe has limitations and uncertainties. Astronomers must be careful to take into account uncertainties caused by a great variety of additional effects, e.g., galaxy lunimosity and chemical composition ("metallicity"). All brightness measurements must be corrected for the effect of "interstellar reddening", that is the absorption of the light by interstellar gas and dust along the line-of-sight to the object that is being studied.